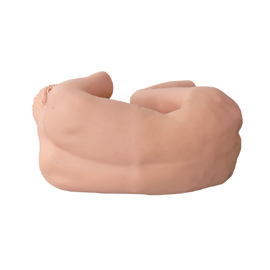 Simulated human stays in lateral position. Its waist and legs are lifelike with realistic touch. It is available to adjust the body to arcuate shape and legs are movable, which is applicable for real situation of lumbar puncture. When inserting the needle to ligamentum flavum, there is resistance while there is no resistance after penetrating ligamentum flavum. When inserting to cavum epidurale, negative pressure will appear. Simulated cerebrospinal fluid will flow out when inserting to cavum subarachnoidale. Applicable for: lumbar puncture, epidural block, lumbar anesthesia, caudal nerve block, sacral nerve block and lumbar sympathetic nerve block.